This section aims to provide a small amount of cultural background for the modern Gaulish language. While this is not strictly dealing with grammatical aspects of language, language is nonetheless the vehicle through which a people’s cosmology and ontology are expressed. As such, it is considered justifiable to provide such information as can be gleaned from historic sources, and to shape it in such a way that it provides an appropriate setting in which the language can be situated. The Gaulish calendar, refered to as the Coligny Calendar after the place where a near-complete version was unearthed in 1897, is the source of much heated debate, bitter argument and endless controversy. The calendar is a lunar one, following the lunar year, but it aims to achieve agreement and balance between the lunar year and the solar year. The model presented here is the only one to date that achieves stunning astronomic accuracy of an unparalleled degree and is distinguished by its high degree of relevance and plausibility. It is the work and intellectual property of Australian computational linguist Helen McKay (2013) and is reproduced here with explicit permission. The translation of the names of the months suggested here is one based on a combination of the etymologies of the names of the months, of the climatic conditions prevalent in Western Europe in the proposed corresponding modern months, and of historically attested cultural information. A modest attempt is made to match it up against 21st century astronomical considerations in an effort to find approximate matches with present day reality.The calendar is approached from a linguistic, cultural, historical and geophysical point of view, and what is proposed here is what is considered to be a plausible interpretation. 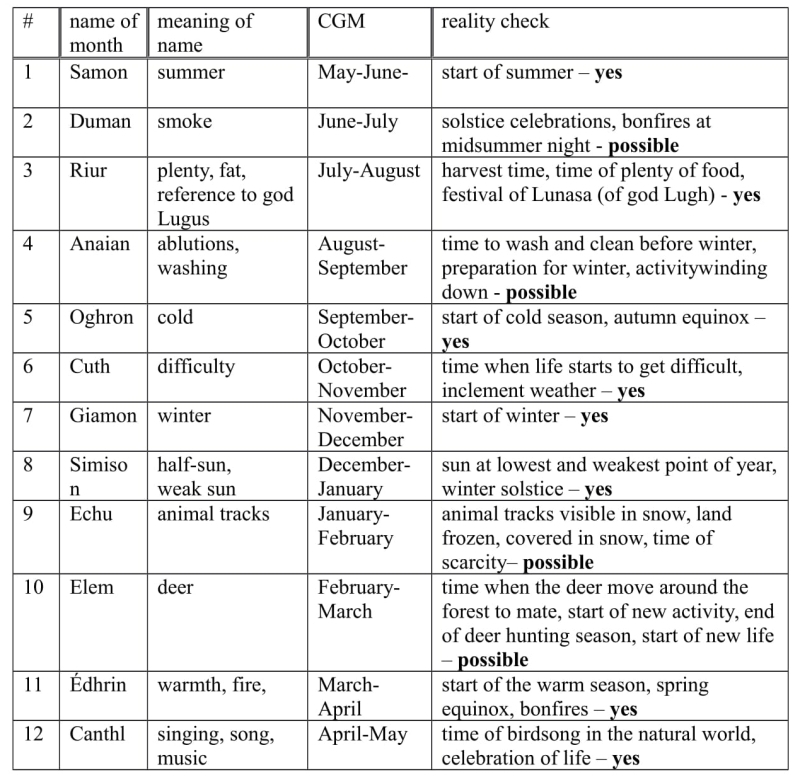 Substantiation for the tentative translation of the names of the months can be found in Delamarre (2003) and draws on contributions from Gwinn, McKay and Cassell (2011-12). Many of the names of the months have several alternative translations. The ones given here were selected based on feasibility, plausibility, probability and overall best fit. There is no official academic consensus on when the Gaulish year started and finished, and opinions and theories vary wildly and are hotly contested. The solution proposed here was arrived at as a result of extensive collaboration and consultation between Helen McKay, Michael Cassell, Bhghros, Bellouesos Isarnos and myself (AtedugyonYektisKeltika 2012-13), with explicit reference to Delamarre (2003) and Lambert (2003). As such, The interpretation of the Coligny Calendar presented here starts the year around May-June, a month before the summer solstice of 21 June. There is no historical support for this, as there is for no other possible starting date. 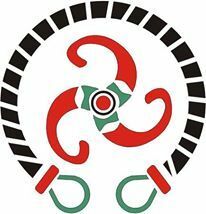 However, taking account of the meaning of the names of the calendar and of their potential relevance to seasonal, climatic and cultural conditions, it is considered reasonable to do so. Support for this theory is provided by Gwinn (2010) and McKay (2013), although significant opposition to this notion can be found with e.g. Cassell (2010-13). It is suggested in the historical record that time reckoning started on the 6th day of the moon. However, it is unclear exactly which phase of the moon that refers to. While it is historically recorded that time was reckoned by nights rather than days and that these started at nightfall, no indication is recorded pertaining the start of seasons and years. In view of the above, and in view of the fact that this calendar goes to great lengths to achieve agreement and harmony between the lunar year and the solar year, the notion is espoused here that months were reckoned in lunations, as is obvious from the calendar itself, and that the four solar events of the year (the solstices and equinoxes) were significant and were taken into account. Though no specific information regarding the use of solar dates has been recorded or has been handed down to this day, the fact that the calendar marries the solar year with the lunar year is here taken to provide sufficient justification for the accordance of relevance to the solar events. All the surviving Celtic languages make reference to summer months in their calendars. It is proposed here that this month heralds the start of summer, and is situated around May-June. It has been suggested that the concept of smoke might be refering to the tradition of lighting bonfires at midsummer night, a custom which is widespread across western and northern Europe and which is thought to be of great antiquity. This supports the notion of Duman containing the summer solstice and fits with a placing of Dumanios around June-July. It is suggested that this month is associated with the god Lugus because of the notations “deuor lug riuri” found accompanying it on the calendar. The word “riur” has also been interpreted as containing the name “rivo-“, which some claim is a synonym of Lugus. The traditional Irish calendar features a festival in honour of Lugus, “Lunasa”, and a month named after it (August). Alternatively, the word “riur” has been analysed as refering to “times of plenty, the fat of the land”. All of these interpretations support an analysis of Riur as a harvest month, which can therefore plausibly be situated around July-August. This is one of several possible translations suggested. A concept of “cleaning up”, washing, tidying up, can be linked with preparations for winter time, putting affairs in order while it is still possible to do such things, before the winter weather makes it hard or impossible. An August-September timeframe might suit this notion. Oghron is one of the very few month names that expert opinion is unanimously in support of a single translation of: it is widely accepted that Oghron refers to “cold”. Suggested as being situated around September-October, this month would include the autumn equinox. Based on an etymology linking Cutio with modern Breton “kudenn”, it can tentatively be proposed here that “Cutios” may refer to difficulty or problems. If considered a “month of difficulty” it could fit in with an October-November slot, refering to a time of inclement weather and difficult living conditions. However, support for this notion has not as yet been found. It is universally accepted by experts in the field that “giamonos” refers to “winter”. At six months’ remove from Samonios, this month can be considered to introduce a “winter half” of the year, just as Samonios introduces a “summer half” of the year, thus dividing the year into two 6-month semesters. Support for this suggested bipartite division is found in the structure of the months themselves, which manifestly consist of two halves of fifteen or fourteen days. A proposed November-December timeslot appears suitable for this month. It is proposed here that this word is analysed as a compound of “simi-“, “half” and “–sonna”, “sun”, translating roughly as “half sun, weak sun”. This admittedly does not account for the syllable –ui-. However, a description of a “half-sun” or “weak sun” suits this month’s proposed situation around December-January perfectly, and could as such be interpreted as refering to the winter solstice: the point of the year when the sun is at its lowest and weakest point. Equos is a bone of contention due to its apparent featuring of a preserved inherited IE labio-velar, which in Gaulish regularly became [p] historically at least 700 years before the estimated date of the Coligny calendar. The etymology of Equos/ Echu adopted here is proposed by Bhrghros (2013): equos < *pekupos, “animal foot”, with regular Celtic loss of (–)p- and maintenance of syllabic –u- after –c-, i.e. not a labiovelar. It is tentatively suggested here that a reference to animal tracks may be intended, possibly in the context of snow covering the land, rendering the land dead, sterile, unyielding. This appears reasonable for a month following the winter solstice, being situated around January-February. It is widely accepted that this word refers to “deer”. A context of deer hunting, or, conversely, of the end of deer hunting may be imagined. In modern France, the hunting seasons of all kinds of native deer (red deer, roe deer, chamois etc.) close in February. While this is obviously a modern arrangement, it is entirely possible and likely that this happens in accordance with deer behaviour, breeding patterns and ecological factors which may not have changed significantly since the time of the calendar. This provides a close match for the proposed timeslot of February-March for this month. There is an equivalent in a similarly named Greek month which introduces the start of the deer hunting season. The suggestion that this word contains a reference to fire, flames or warmth is reasonably widely accepted. Since it is suggested that this month is situated around March-April, it can be imagined that it announces the start of the warmer weather. This month would also include the spring equinox, another event traditionally associated with bonfires. A reference to song or music is commonly agreed upon for the name of this month. It has been suggested that it refers to the presence of birdsong in the natural world, which provides a match with the timeslot proposed for this month, April-May. The following table summarises these translations and compares them with realistic conditions and/ or practices at corresponding times of year that are proposed and adopted here. CGM stands for “Corresponding Gregorian Months”. The above table indicates that the proposed schedule is feasible, possible and reasonable. In the spirit of the Gaulish habit of naming things in opposite pairs also evident in the onomastic material (see Delamarre 2003, p. 351-352), it is possible to tentatively propose a grouping of the names of the months in opposing pairs, and a divsion of the year in a summer half and a winter half. 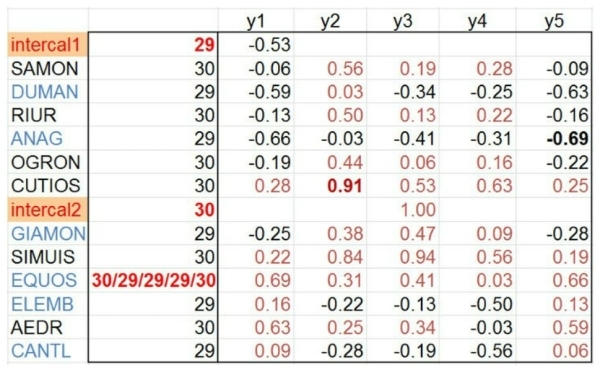 In this model, each of the months finds its perfect opposite in the exact same spot in the opposite half of the year, as is illustrated in the following table. While the above interpretation is certainly possible and feasible, it is important to bear in mind that it is only one interpretation and makes no claim to being anything other than a reasonably educated guess. The Gaulish calendar ran over a period of five years, during which time intercalary months were inserted to match the solar year to the lunar year. The year varied in number of days over the five years. The beginnings and ends of the various months oscillated to and fro to the extent that can be seen below. The length of months varied between 29 and 30 days, varied from year to year, and were designated at either favourable (“mat”, math in modern Gaulish) or unfavourable (“anmat”, anwath in modern Gaulish). The brilliance of Helen McKay (2013) lies in the fact that by adjusting the length of the months of Echu, which are not clearly recorded, to a length that is in keeping with the rest of the months, she has produced a calendar model that achieves perfect balance and agreement between the lunar year and the solar year. As such, it is proposed that the Coligny calendar is a Metonic calendar, lining up the lunar year with the solar year every 19 years. This is achieved by adjusting the length of Echu as appropriate (see model) and by repeating three cycles of five years complemented with a fourth cycle from which the first year is deleted. In this way the lunar and solar year are perfectly aligned every 19 years. While there is a certain amount of speculation regarding the deletion of cycles and the adjustment of the length of Echu as required, the bronze plaque that constituted the calendar was fitted out with a complex series of peg holes. It is thought that these pegholes served the exact purpose of indicating these adjustments. Furthermore, the bronze calendar plaque under discussion would have been able to function as a perpetual calendar: thanks to the peghole-adjustment system, it would have been possible to keep it in synch with the real world perpetually. As such, it is without a doubt the most sophisticated and advanced calendar of the Classical world, and is a monumental testimony to the knowledge, achievement, understanding and organisation of the Gaulish people. For a detailed discussion of the workings of the calendar, see appendix The Coligny Calendar. Below is the layout of the Coligny Calendar (reproduced with permission). The names of the months are given in the original ancient Gaulish, as per Helen McKay’s work. 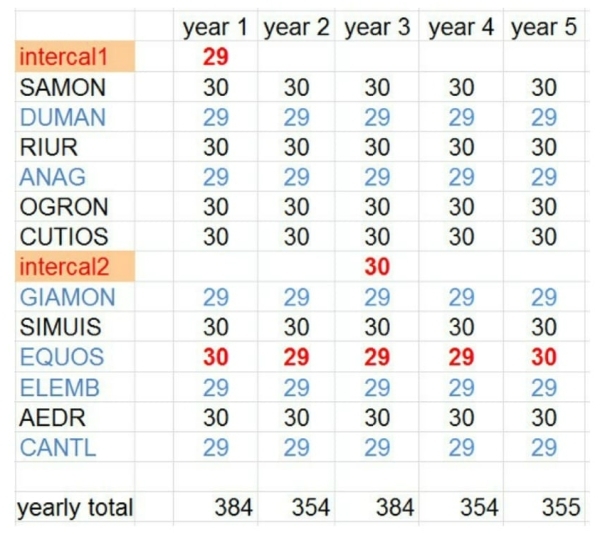 The extent to which this model was able to keep in synch with real time is shown in the following table, showing the fraction of days by which the timekeeping deviated from true. Note that at the second intercalary the difference is exactly one day. This model allowed the Gaulish people to keep track of time accurately and, over a timespan of 19 years, never be out more than one day, which ultimately got caught up after 19 years. While it is posited here that the calendar’s time reckoning starts around May-June, this is in actual fact irrelevant: the time reckoning could start anytime, and the model would still hold true. No truer, more accurate calendar or system of time keeping has been recorded anywhere within antiquity or pre-modern times, and it was not until the scientific advances of the 20th century that the Gregorian calendar was able to come up to the standard set by the genius of the Gaulish people. It is generally agreed upon that there was no such thing as an organised Gaulish Pantheon, or, that if there was, that information about it has not been accurately recorded. What follows here is a synthesis, interpretation and manipulation of authentic recorded information (see Delamarre 2003; Griffin 2007), brought together in a conceptual framework that while it aspires to be plausible is nonetheless completely arbitrary. Gods and Goddesses are organised in 4 groups of three triads. The first group reunites the phenomenological deities, the second one the deities governing the natural world, and the third one those deities concerned with the activities of everyday human life. The final group deals with the relationship between humanity and the universe through supplication. It is generally felt that the gods and goddesses in the first group are in a position of hegemony over those in the “lower levels”, with the exception of those in the last triad, who instead are overlords over sections of the Pantheon and, by inference, over the other gods and goddesses. This lends a circular aspect to the web of relationships. The latter triad refers to the vertical structure of the universe. It is conceived as a Tree of Life (Pren Bith) that has three levels. The upper level is the Land of the Gods (Brói Alvi), the bright and shiny world of the sky, represented by the crown of the tree. The middle level is the Land of the Living (Brói Bith), the organic world of the surface of the Earth, above ground, represented by the trunk of the tree. The lower level is the Land of the Dead (Brói Duv), the underworld, the deep and dark world under the ground, represented by the roots of the tree. Alvrich presides over Brói Alvi, Bithrich presides over Brói Bith, and Duvrich presides over Brói Duv. Logically, these are therefore the overlords of all the other Gods and Goddesses mentioned above, each in their own domain. To reach the underworld, the dead have to complete a threefold journey across all three levels of the universe. On each leg of the journey, they are accompanied by a different God or Goddess whose job it is to see them safely through to the next stage. In addition to this three-tiered cosmology however, there is Brói in Ióinché, the Land of the Young. The Land of the Young is a paradise-like place that exists on the middle level, alongside of the land of the Living, but invisible and inaccessible to it. In the Land of the Young, time is suspended: there is no decay, only enjoyment. Entry can only be gained through magic, and often only through specific geographic locations, where temporary passageways between the worlds can be opened: hilltops, cavemouths, stonecircles; or at certain times of the year (e.g. the turn of the new year). conuissu, ac re bisiet certo rissies adauuo canti doni alli en menman braterione. conchwísu, ach ré ví certh richís adhávó can dhoné al en wénu bratheríu. The invasion of an independent sovereign nation by an aggressive, expansionist, imperialistic state bent on conquest for reasons of political and personal profit, led to the murder of hundreds of thousands of men, women and children, and the exile into slavery of hundreds of thousands more. It resulted in the obliteration of an erstwhile autonomous people’s culture, identity and language. Language can be revived. People can’t.